The first stop once arriving in Florida and the last stop on the way to the airport is always Jaxson’s Ice Cream Parlor and Restaurant. The line to dine in can be fairly long, however there is plenty of entertainment while waiting. The infamous man with the monkey will allow for photos and performs tricks, after his hat has been filled, of course. Watching the children riding the mini carousel and testing out the hurricane simulator also helps to pass the time. There are giant cutouts of ice cream sundaes and Jaxson’s famous kitchen sink to take pictures in (someone can even be the face of the cherry on top). Once the wait is over, you are escorted to your table by the waiters and waitresses, who are all dressed in red and white pin stripes. Every inch of the walls are covered with old license plates, from Florida to Ohio to Texas to California, and everything in between. 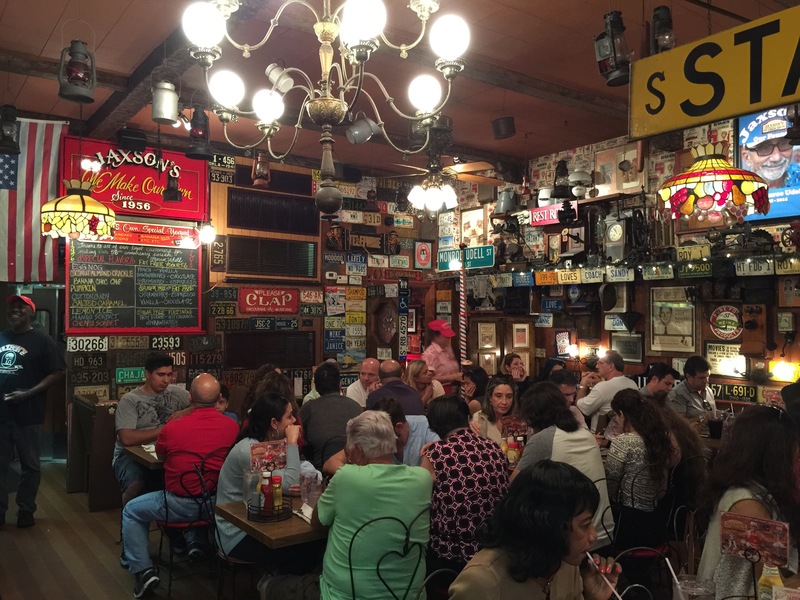 No matter where you sit, there is always an interesting article or photo on the wall nearby that will forever be a highlight of your visit to Jaxson’s. With a pitcher of water and classic Jaxson’s cups, which are now sold in the shop, a complimentary bowl of popcorn will be the first to arrive at the table. If you are use to ordering one scoop of ice cream, this is not the place for you. Jaxson’s minimum ice cream order is two enormous scoops, but if that is all you order, you will be judged! The menu features five scoop banana splits, half gallon root beer floats and crazy concoctions with oreos, strawberries, malt and much more. 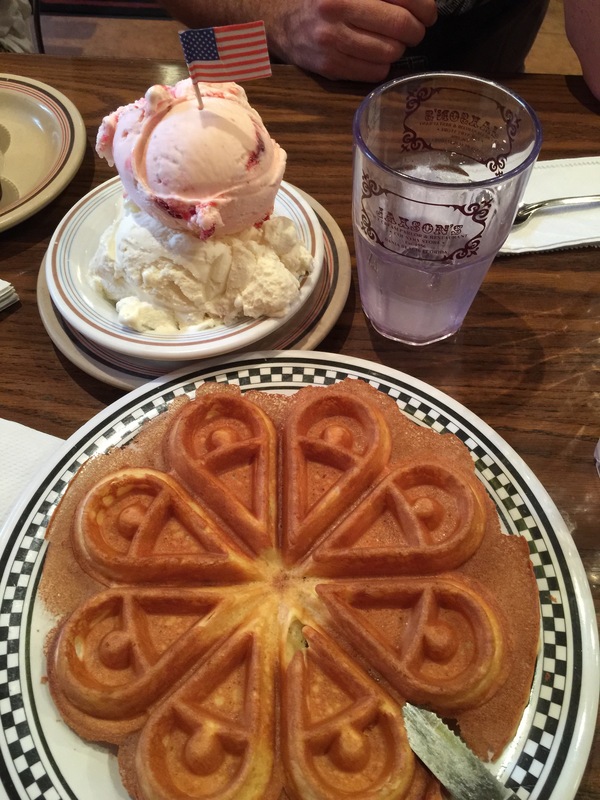 My go-to order is the fresh made Belgium waffle with one scoop of vanilla and one scoop of strawberry ice cream. The trick is to order the waffle well done and the ice cream on the side because then the waffle comes out super crispy and the ice cream does not melt and make it soggy. My mom ordered a waffle well-done with one scoop of coffee ice cream and one scoop of pistachio ice cream. Since it was her birthday, the waitress cranked the fire siren and out came a sparkler atop her heaping scoops of ice cream. Jaxson’s is one of the best places for birthdays! My sister ordered an extra thick chocolate malted milk shake extra thick and you needed a spoon in order to eat it. Topped with whipped cream, malt powder and a cherry, this shake will satisfy your craving. Jaxson’s menu has so much variety, so sometimes it is a tough choice. 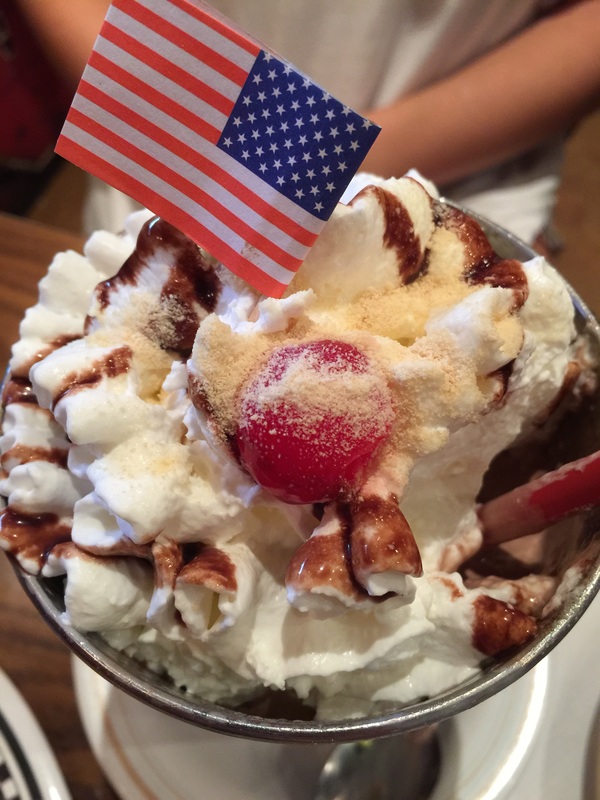 Some other concoctions we had in the past include the banana split, pitcher of root beer float, malt sundae and Oreo sundae. The one thing on the menu that we have yet to try, but hoping to conquer soon is the kitchen sink. This is one of their famous innovations to ice cream as we know it. It is exactly as it sounds, a full kitchen sink is brought to your table with everything you can imagine and over 20 scoops of ice cream. When this does finally happen it will have its own post. If you are in the area or looking for a day trip while in Florida, definitely stop by Jaxson’s, if you have never been. They offer indoor and outdoor seating and have a take out window for those on the go. It is one of the best home made ice cream spots I have been to and will continue to travel back for my fix of their warm waffle with ice cream!